How Far is Sai Kuteer? Sai Kuteer ia anew prestigious project of Raja Infra Projects. This layout is being developed in a fully grownup coconut garden. The project has aesthetic, design, lush greenery and unique landscape in tranquil atmosphere. It is an ideal place for comfort and peaceful living. The serene atmosphere and pollution free air will rejuvenate you all. It is a right value for your investment, because it is a place for blissful living. Just 38 km from city. Just 30 min Drive from RTC Complex. Just 1km from NH – 5. 6 km before to Bhogapuram IT Zone. 16 km to Gambheeram IT Park (SEZ). 24 km to Madhurawada IT Hub. 25 km to Ramanaidu Studios & Vizag Filmcity. 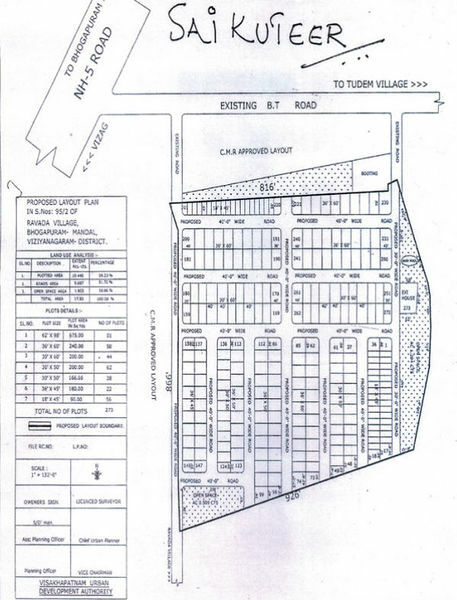 5 km to VMR Proposed Imax & Shopping Malls. 14 km to Bheemili Beach Resorts. Close to Many Industrial Parks (Non-Polluted). Project within Visakhapatnam Metropolitan Limits. Sourrounded by Existaning Residensial Colony. Secured Location for Immediate Construction. 7 km from Westwood International School. "Raja Infra Projects" is a name synonymous for its quality and reliability. Raja Infra Projects Pvt Ltd was established in the year 2008 with a vision to become a leader in the Real estate & infra structure segment. The company is having the marketing experience of 13 years in manyProjects. Living is not just leading the life. This philosophy truly reflects in all the projects designed by Raja Infra Projects.